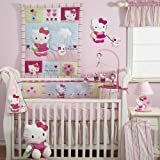 The Hello Kitty & Puppy 4 Piece Baby Crib Bedding Set includes: quilt, bumper, dust ruffle and fitted sheet. The quilt measures 32.5 inches x 42 inches. The 4-piece bumper is 9.5 inches high and 154 inches long. The long sides are 9.5 inches x 50.5 inches, with 4 sets of ties along the top and bottom. The short sides measure 9.5 inches x 26.5 inches with ties on each corner. The dust ruffle has a 10 inch drop, and the sheet is designed to fit a standard size, 28 inch x 52 inch crib mattress. This set is made of 55% cotton and 45% polyester. Fabric content is exclusive of decoration.